Radio Stations: Installation, Design and Practice is concerned with various methods used in the planning, design, and installation of radio stations. The stages involved are discussed, from determining the ideal layout to drawing out the site plan and outlining the building plan. The factors to consider in the relative siting of the building are also addressed, along with the selection of the desired aerial and earth systems as well as the masts and/or towers. Comprised of 12 chapters, this book begins with a review of things to consider when choosing and inspecting a site for the proposed radio station, including good soil conductivity and dielectric properties to good access roads and availability of electricity supply within reasonable proximity. Subsequent chapters focus on the selection of buildings; the choice of masts or towers for aerial systems; design, construction, characteristics, and method of installation of transmission lines; and aerial systems commonly used with communications systems. The book also looks at transmission line switching systems, control units, and workshops. 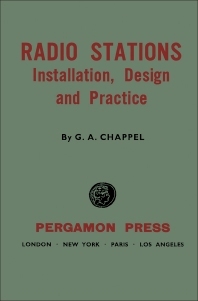 This monograph is intended for radio engineers and station designers.